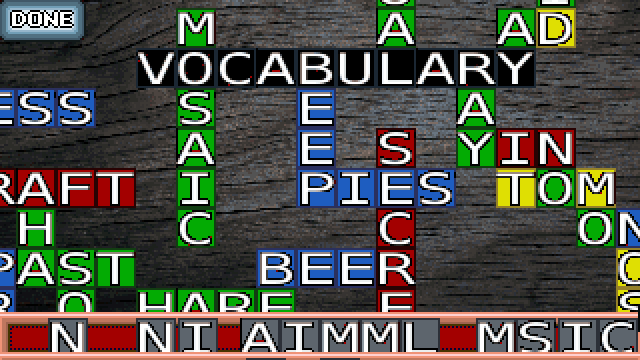 I made a new version of Vocabulary Mosaic. This version has larger tiles, some visual improvements, control improvements, and perhaps most importantly, it can save your progress automatically so long games do not have to be played in a single sitting. I was asked to write a game design article for Hamsterspeak Issue #36. Instead of just writing an article, I wrote a game. 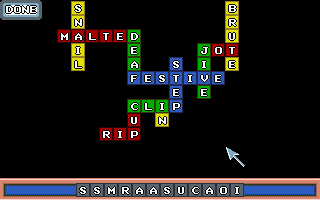 I had recently been playing a lot of Words-With-Friends with my Sister and my Brother-in-Law, and that had me thinking about word-tile games. 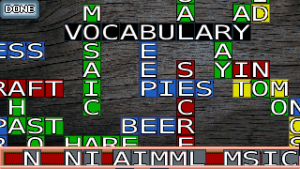 One thing I don’t like about word tile games is the limited size of the board quickly cramps the word space, and the double and triple score boxes force any winning strategy to emphasize small words on score boxes in favor of long words. 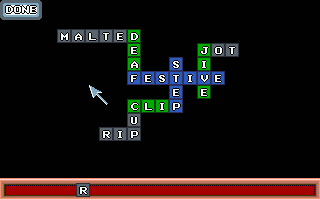 So I set out to make a word tile game that rewards long words most of all. The result was Vocabulary Mosaic.